The Moro Foundation will not sell, lend or forward by any other method, information that it receives over the internet to a third party. All information is managed in confidentiality and will be used solely for internal records and for the purpose for which the information was provided. The contents of the internet site are of an informational nature. The Moro Foundation does not incur responsibility for the accuracy, perfection or actuality of published information nor for any damages that the internet site user may incur as a result of the accuracy, perfection or actuality of published information. Users use all published information exclusively at their own risk. The Moro Foundation maintains the right to add, change or remove the contents of this website at any time and without prior notification and does not incur responsibility for the consequences of these changes. All information, text, photographs and drawings on the internet site are products of author’s rights and other forms of intellectual property protection. It is forbidden to reproduce content in whole or in part, except for the purpose of personal and non-commercial use, in which case all listed warnings in relation to author’s or other rights must be maintained. 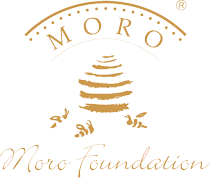 The Moro Foundation collects and protects personal information and information about physical and legal entities forwarded by users of the internet site in accordance with the Personal Data Protection Act of the Republic of Slovenia. Cookies are activated during the use of the internet site. Cookies provide information about users’ visits to internet sites. While visiting an internet site, a cookie (data with information) is stored in the user’s computer. This ensures quick user access to the internet site, while it also encroaches upon the user’s confidentiality. Cookies contain basic information about the user’s visit to the internet site (the number of the user’s computer or rather, the name of the user and the name of the visited internet site, the date and hour of the visit). The content of the cookies is stored in a user’s computer. “Strictly necessary” cookies are essential for a webpage to work properly (for example for saving products in your shopping basket). Preference or functionality cookies (a webpage remembers your language preferences and offers you the same ones by your next visit). This cookie can only be used for our webpage and doesn’t follow you to any other webpages, where you have to set the desired functions by yourself. Analytical cookies are used for statistical purposes (they can show us the most visited contents or which contents are not being viewed by the visitors…). In this way we can ensure better contents of our webpage. This information does not include any identification details and is anonymous. Advertising cookies are used for advertising by third parties. They inform the owners, which web pages you visit, which advertisements you view, etc. We do not use these cookies on our web pages. At the moment only the first and second group of cookies are used on our web pages. In case the third and fourth group of cookies are active, you can turn them off on your own and disable them. In case of forwarding or hyperlinks to Moro Foundation webpages from other websites which are owned or managed by a third party, the Moro Foundation does not accept responsibility for the content or correct functioning of these webpages. In the event of referencing or connecting the internet pages of the Moro Foundation with other sites that are under the ownership or management of third parties, the Moro Foundation does not take responsibility for the content or accurancy of the activities of the third party internet sites. All wording, photographs, pictures, graphics, animations and other documents are contained in these internet pages within a legally permitted framework and are the object of author’s right or another form of intellectual property protection.